These modules are designed to be a self-paced, interactive learning tool. Each module takes approximately 30-45 minutes to complete. Users can choose to do as many modules as they need to meet their learning requirements. Clinician Module 1: ARF/RHD What is it? This module is an overview of ARF and RHD in the global and Australian context. It includes the ARF/RHD disease pathway, an introduction to the Jones criteria for diagnosis of ARF; disease statistics from northern Australia and RHD prevention strategies including a summary of Australia’s Rheumatic Fever Strategy and RHD control program objectives. This module includes a description of the autoimmune response in relation to ARF and highlights risk factors for the disease. It includes a description of primordial and primary prevention including changes to environment and the development of a vaccination to prevent GAS infections. This module is a discussion of the Jones criteria for diagnosis of ARF as applied to children. It includes a description of the major manifestations including investigations and treatment, the minor manifestations, key points and differential diagnosis, and the difference between definite and probable diagnosis. This module is a discussion of the Jones criteria for diagnosis of ARF as applied to adults, including challenges around diagnosis in older people. It includes a description of the major manifestations including investigations and treatment, the minor manifestations, key points and differential diagnosis, and the difference between definite and probable diagnosis. This module is a discussion of the principles of secondary prevention of ARF and RHD. It includes drug treatment regimens to prevent recurrence of ARF, and strategies for reducing injection pain. It also includes information about how RHD programs and registers can be used to monitor and improve treatment delivery, and reduce the prevalence of RHD among those at risk. 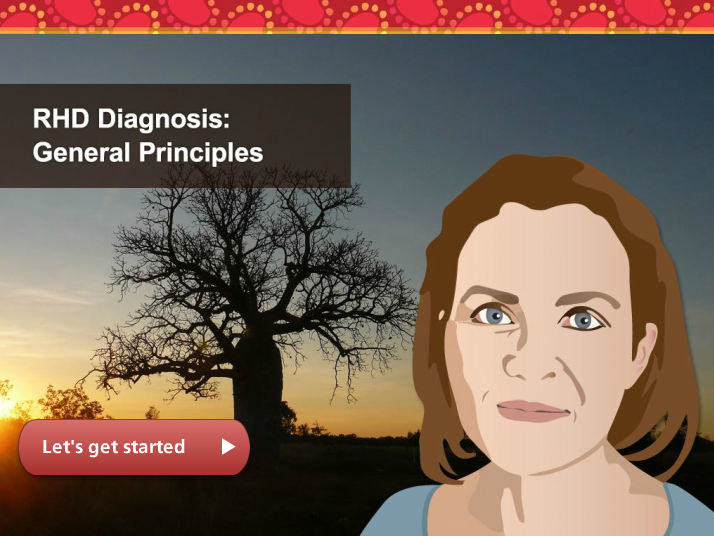 This module is a discussion of the key principles of RHD diagnosis. It includes common issues and some unusual presentations; it highlights some of the barriers to RHD diagnosis and management, and includes an introduction to the mitral and aortic heart valves, and the importance of echocardiography in aiding diagnosis. This module contains information about the importance of oral hygiene and dental care in preventing health problems, such as endocarditis, in people with RHD. This module focuses on diagnosis and management of mitral regurgitation and stenosis. For each lesion it includes signs and symptoms, diagnostic techniques including interpretation of auscultation and echocardiogram findings, and barriers to management. It also includes information about criteria for surgical referral for mitral stenosis, and highlights the risk of atrial fibrillation in mitral valve disease. This module focuses on diagnosis and management of aortic regurgitation and stenosis. For each lesion it includes signs and symptoms, diagnostic techniques including interpretation of auscultation and echocardiogram findings, and barriers to management. This module contains information about the symptoms and diagnosis, and medical and surgical management of mitral stenosis in RHD. This includes relevant diagnostic assessments and practical issues and follow up of percutaneous balloon mitral valvuloplasty. This module is an introduction to the main causes and clinical features of stroke related to RHD. The information focuses on embolic stroke with infective endocarditis and prosthetic heart valves. Haemorrhagic stroke and over-coagulation are also discussed. This module contains information about the safe use of warfarin and provides practical information about managing patients requiring anticoagulation medication in remote settings. Monitoring INR and warfarin documentation is also discussed. This module contains information about infective endocarditis in relation to RHD. It includes a summary of risk groups, causative organisms, signs and symptoms, the Duke criteria and use of echocardiography for diagnosis, complications, and strategies for prevention and management. This module contains information about the risks and management of RHD in pregnancy. This includes discussion about specific valve lesions, pregnancy planning and counselling, surgical intervention and maternal outcomes. This module includes an introduction to the principles of screening as applied to RHD. This includes suitability for screening, reliability of the screening method, effectiveness of treatment and the cost of finding cases.